Just recently, my dog has had a couple bladder problems. 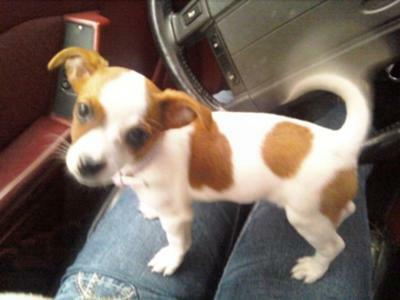 She is an 8 month old Rat Terrier/Chihuahua mix, and has not had house training troubles before. Yesterday, she was sleeping on my bed for a couple hours, and I found that she had urinated in my bed. Today, she was sitting on my lap and then I noticed a little pee on my leg. Both times she had just recently been outside, and like I said she has not had potty-training problems before. When she did have an accident, it was in a corner somewhere, not in my bed or on my lap! She was recently spayed 2 months ago, and she was attacked by a Pitbull 4 months ago and had major intestinal surgeries, so I'm wondering if that has anything to do with it. Any suggestions/ideas/help would be greatly appreciated! Thanks! Incontinence is common in spayed females, and is usually caused by reduced capacity of urinary sphincter (musculature) to stop the flow of urine. In this case, it seems that she had been through a number of health issues such as spaying, surgery and now urinary incontinence. It appears that this loss of health status has affected the physiological capacity of your dog. Estrogen therapy, usually done with a product containing Diethylstilbestrol (DES) is the most effective treatment option for females that have been spayed recently and are facing incontinence problems. It is usually prescribed in consecutive doses for 7 – 10 days and then reduced to a single dose in a week thereafter. Since Diethylstilbestrol is a non steroidal estrogen derivative, it is only available by prescription from your veterinarian, as severe bone marrow complications are associated with the medication. Estrogen therapy is a specific treatment for this condition, thus it should be effective in treating the underlying problem. Symptomatically, urinary incontinence can be treated with natural remedies such as Better-Bladder Control , which do not require a prescription and can be used per the directions of manufacturer. Disposable Diapers and pads for controlling frequent and unusual urination until your dog recovers. Monitor her health status, and give her extra supplementation. Consult with your veterinarian frequently, to monitor your dog's health status. I am sure she’ll be fine soon.